Yesterday the Bank of Japan announced that it will be buying Japanese equity ETFs as well as property funds (REITs) to boost demand for risk assets. The BoJ has done this before but the timing of this announcement suggests a new push to accelerate monetary easing. This action is coming on the heels of the Government Pension Investment Fund's (GPIF) recent announcement that it will increase its allocation to Japanese and foreign shares to 25% from 12%. The yen continued to sell off as a result of this accelerated easing and is now hovering around a 7-year low. With the support from weaker yen and the official sector's renewed demand for shares, the equity markets had one way to go. The Nikkei 225 broke through 17k - a levels we haven't seen since 2007. But while investors cheer this flood of liquidity, Japan’s lower-wage workers are being left behind. Wage increases in Japan are simply not keeping up with rising import prices (due to weaker yen) as well as with higher consumption taxes. 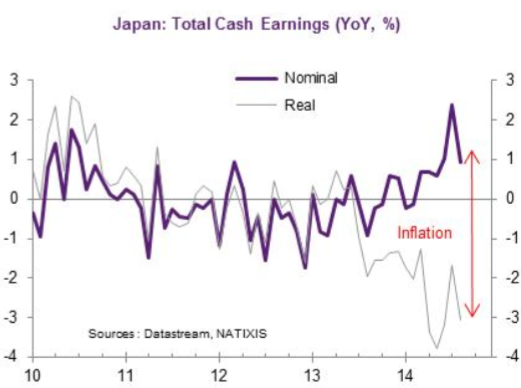 And as the yen takes another leg down, many of Japan's workers, especially those who are non-union and part-time, will see their real wages decline further. Meanwhile, financial assets will be hitting new highs. For those who believe that "unconventional" monetary easing widens the gap between the wealthy and the poor (and there has been plenty of debate around the topic), Japan could become a prime (and possibly extreme) example of QE-driven inequality. 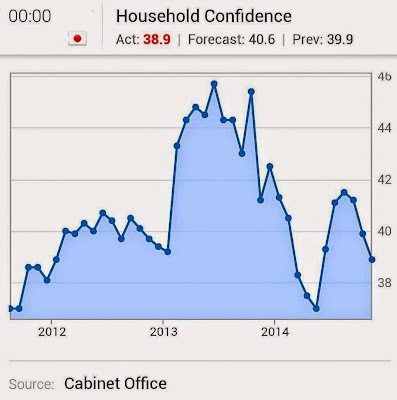 As a further confirmation of this trend, today's report on household sentiment was worse than expected. Negative real wage growth is just not being offset by rising share valuations - especially for households that simply have not participated in the rally. With no end in sight for BoJs unprecedented monetary expansion, the nation's households are likely to face more hardships ahead.